I’m pleased to say that I reached this some weeks ago and submitted my application to the ARRL. I actually waited until I qualified for two awards, the initial ‘mixed’ and also for ‘phone’. A couple of weeks later the certificates arrived and so I’m pleased to be able to post one of them here. It’s not the prettiest certificate in the world, in fact I think it looks quite dated but I’m very pleased to have received it along with the second one I have which is endorsed ‘Phone’ to indicate all QSOs were made using voice. It’s really not that difficult to work 100 different DXCC entities these days and I nearly managed to do it during the recent CQWW SSB contest. What can be difficult is getting all the QSOs confirmed afterwards but even that is pretty straightforward. All my contacts were confirmed electronically using Logbook of The World. This entry was posted in Amateur radio and tagged dxcc. Bookmark the permalink. 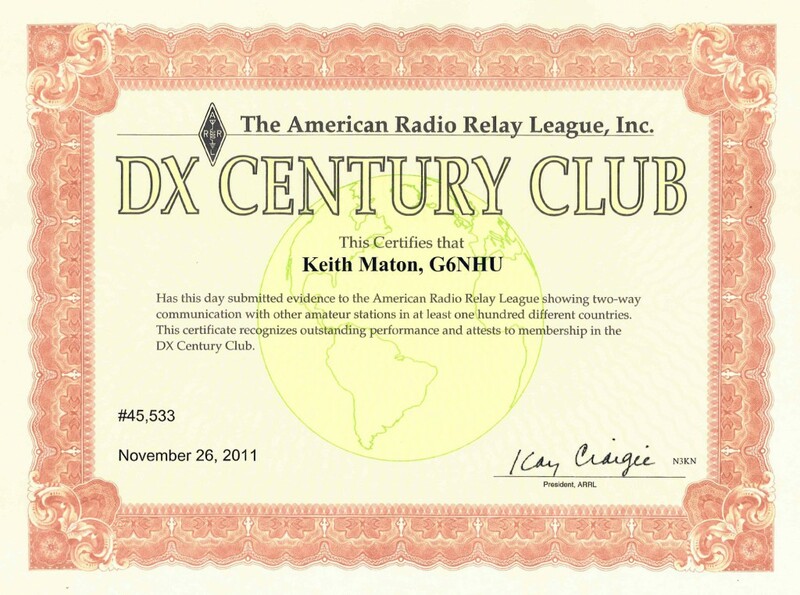 Well done… doubt it will be too long before you’re getting the dxcc band certificates and sticking on the 150 and 200 endorsements.